Since 1993, Griffco Valve has been manufacturing high quality chemical feed equipment for pumps and systems in Amherst, NY. Products include, back pressure valves, pressure relief valves, calibration columns, injection valves, corporation stops, and other chemical feed accessories. All product Griffco manufactures are proudly made in the USA. Griffco is NSF, CE, and ISO 9001 certified. Griffco works to find the best local suppliers and employ highly talented professionals to ensure customer satisfaction. Every employee is committed to give the customer the best service and support. With thousands of valves and other accessories made since they started, Griffco strives to inform customers on where and how to get the best product, right answers, and trusted support. Giffco has a wide distribution network and supplies OEMs, leading metering pump companies, and other positive displacement pump companies with products ensuring proper pump and system operation. Griffco has years of chemical feed experience for a wide range of applications, markets, and different pumping technologies. Customers can depend on Griffco’s high quality great customer service, and reliable shipments. 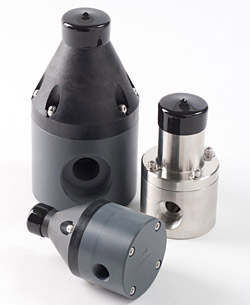 Griffco offers a variety of back pressure valves for low to high flows. 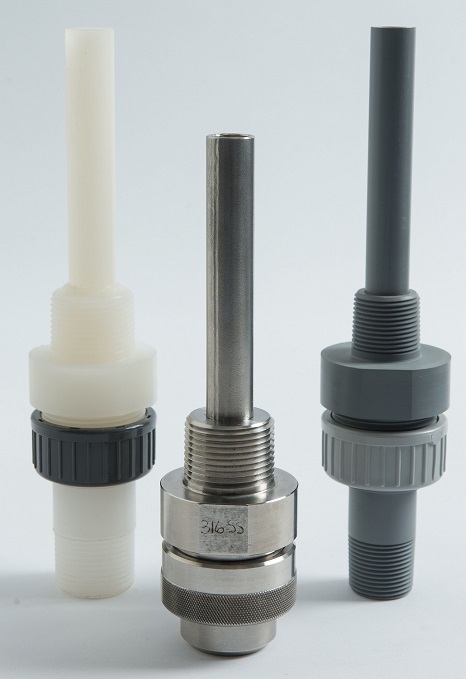 The valves come in a variety of materials to meet your application needs. The have 180 degree, 90 degree, and wall mount configurations and are available in threaded, flanged, union, or socket connections. 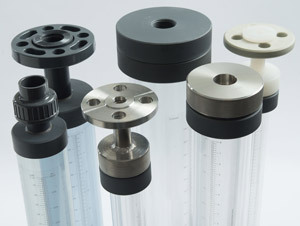 Griffco Calibration columns come in PVC or Borosilicate glass and are used to verify the flow rate of a chemical feed pump. There is a wide variety of sizes and materials to choose from to best suit your application needs. 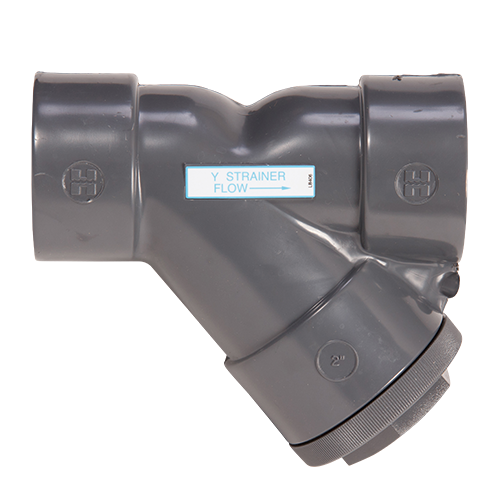 Connections include: threaded (standard), socket, flanged, flanged with ball valve, and union. Available in both imperial and metric units. Griffco Injection Valves or quills ensure that chemical feed systems inject into the center of a process stream for better mixing and to prevent corrosion along the process pipe. A check valve prevents the process fluid from going back up the chemical line. Griffco offers the ICV serviceable injection valve and the IVQ high pressure injection valve. The IVC has threaded and socket connection, comes in a variety of metals and plastics, and fast and ease union disconnect for servicing. The IVQ comes in a range of metals and has threaded connections only. Griffco Y-Strainers enhance the performance of chemical feed systems by preventing debris from entering the suction side of a chemical feed pump and clogging the check valves or damaging the interior of the pump head. They have either horizontal or vertical installation or a hex cap for easy screen access. A variety of PVC options are available with 316 SS screens optional. Griffco Pulsation Dampeners reduce shock, noise, and provide smoother flow in a chemical feed system. There are a variety of construction materials and diaphragm options. Connections include NPT, BSPT, Union, and flange. 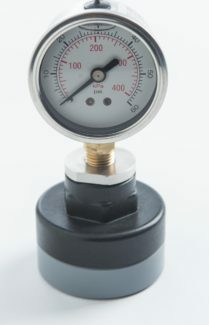 Griffco offers gauges helps verify that optimal pressures are maintained. Diaphragm isolators protect instruments against chemical attack. 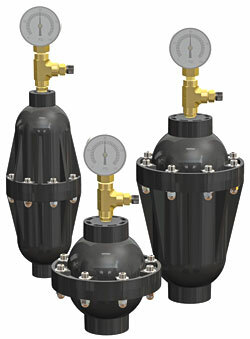 Pressure regulators and check valves are also available.